Eager to endow Apple’s mass-produced modern marvel with some timeless personality? 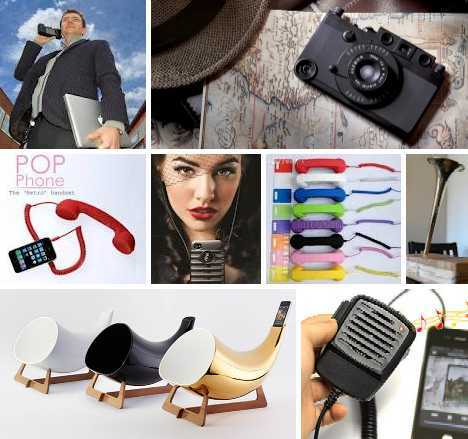 Retro iPhone accessories give your cutting-edge cellular communicator old-fashioned style to complement its right here, right now functionality. Camouflaging your iPhone as a classic C90 cassette tape isn’t just a shout out to your Eighties roots, it’s also a cool way to turn off potential thieves. 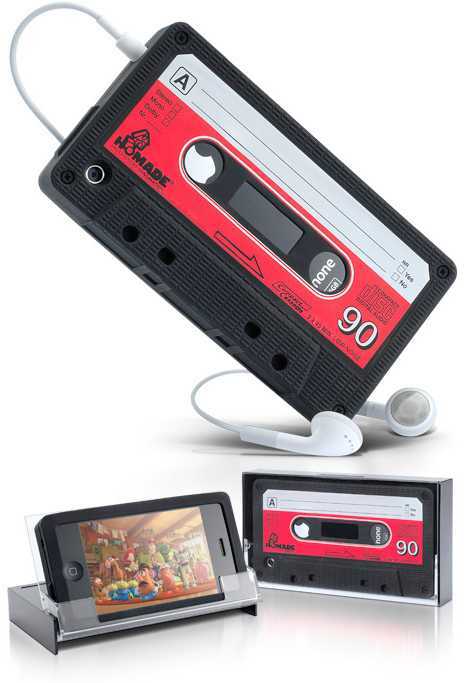 The case fits neatly into a faux cassette tape box which doubles as a stylish stand. Eh, what’s up, iPhone dock? 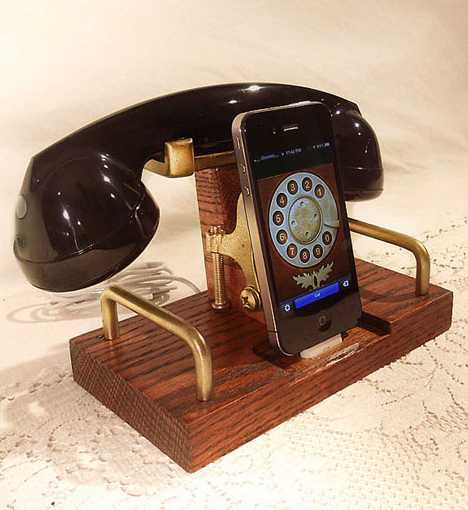 A number of retro iPhone docks copy the old-time look of tabletop telephones, with the mobile phone typically sitting right where the dial used to be. 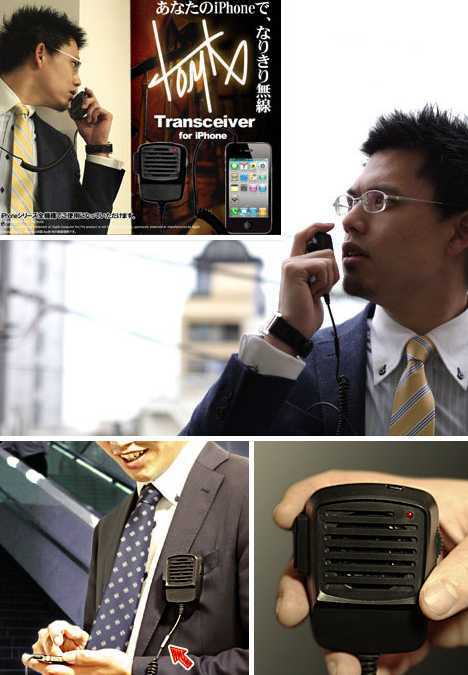 Some models include a fully functional handset that hangs off your belt when you’re out shadowing the Fat Man. 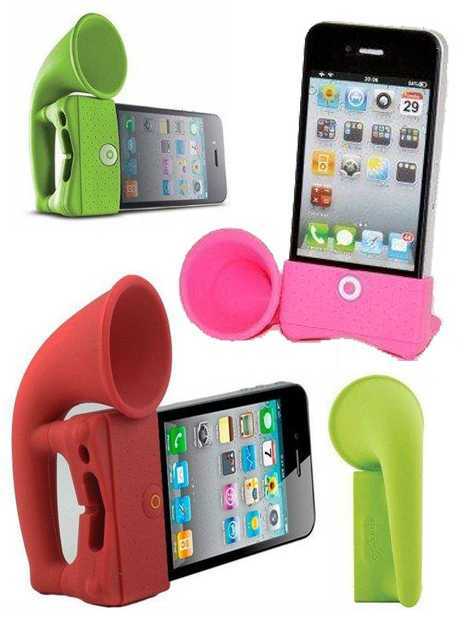 Considering how often iPhone owners use their docks it’s no surprise said owners are looking for a little more style. The model above would look smashing on any desktop, ideally set beside a statue of The Maltese Falcon. 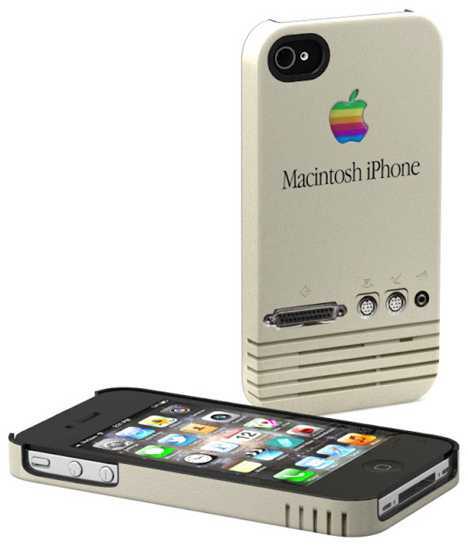 Are you an iPhone owner with a soft spot for the 1989 beige Apple Macintosh sporting the rainbow Apple logo? 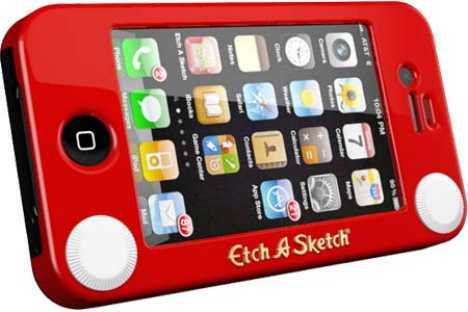 If so, hopefully you’ve discovered the lovingly designed and crafted Apple-inspired iPhone cases offered by Schreer Delights. Latecomers should be advised that Schreer recently withdrew their Apple-inspired cases, possibly influenced by the Cupertino corp’s eager legal beavers. Pre-war oldsters used to assist their hearing via the use of ear trumpets. Post-war hipsters are doing much the same, only instead of their ears they’re amplifying their iPhones with cute, colorful Horn Amplifiers that beg to be seen AND heard. In the hierarchy of horns, the Megaphone is king. 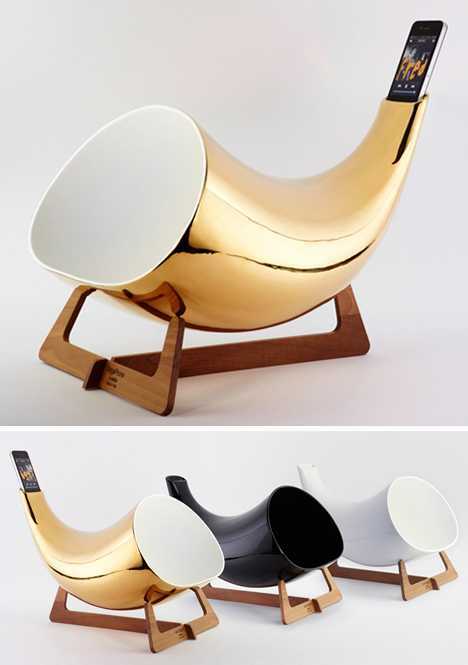 Big, bold and beautiful, Megaphones are the Swiss Alpenhorns of the iPhone amplifying world and they look great with or without an actual iPhone riding up top. 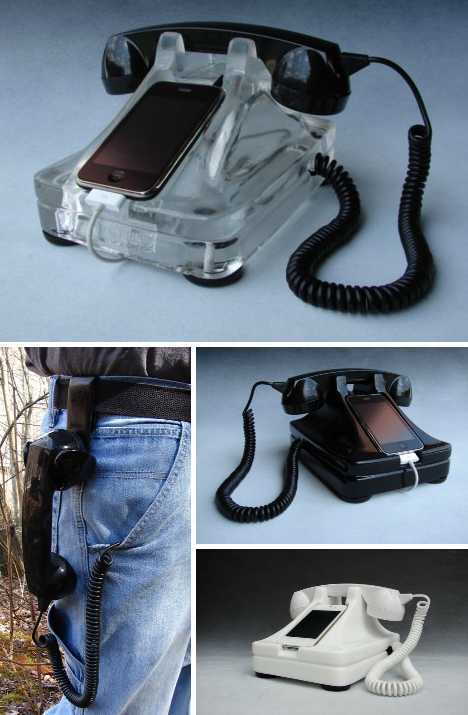 The Tomko Transceiver for iPhone evokes the glory days of CB radios but eschews the Bandits, Bears and bad records by C.W. McCall. The device combines the best features of hands-free communication while sparing users from having to wear a Bluetooth device in their ear. The Yubz Handset was one of the first hand-held accessory mobile phone receivers to hit the market and they’re available in a wide range of colors and patterns. 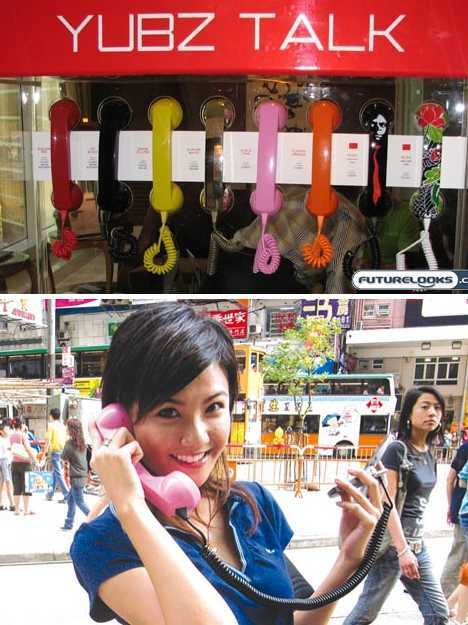 Using a Yubz Handset isn’t only about making a fashion statement, however. 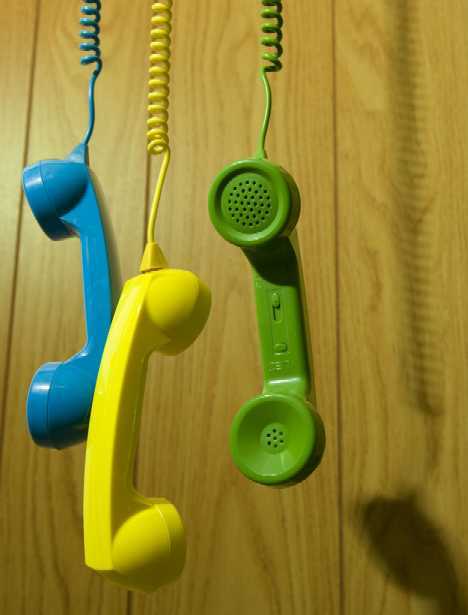 The old-style handset offers exceptional hand and ear comfort for long conversations and by keeping the phone distant from the user’s head, any concerns over possible microwave radiation are effectively allayed. One might say Leica is the iPhone of cameras: a paradigm of ergonomics, functionality and quality. 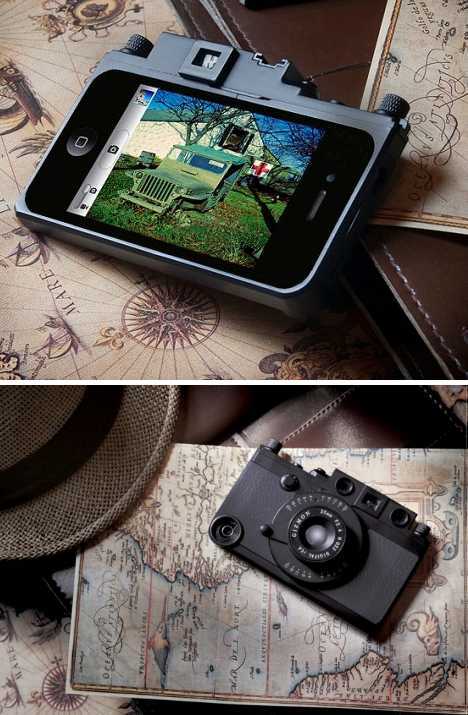 Now Gizmon conjures up the mystique and magic of the legendary Leica Rangefinder with a high-functional, multipart iPhone case. The Gizmon iCA Military Edition case is no one trick pony – a real shutter release button mounted on top blurs the line between phone and camera. 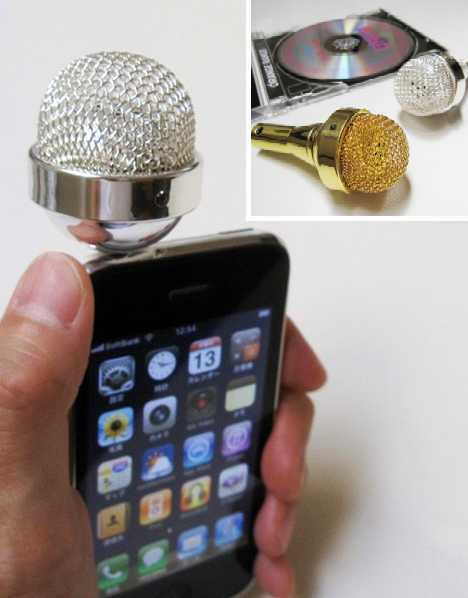 If David Letterman can sport a huge retro microphone on his desk, why can’t you do the same for your iPhone? 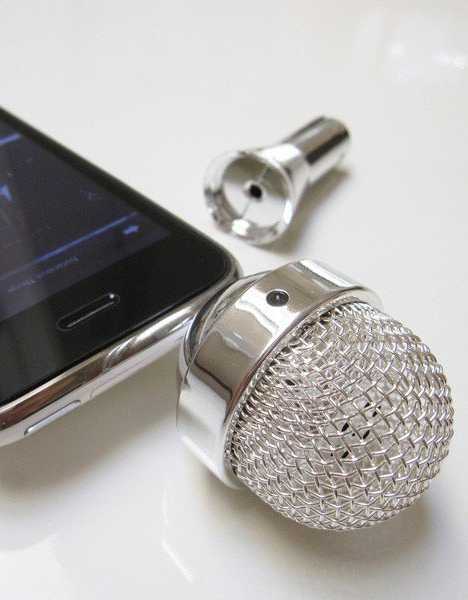 Actually you can, or to be more accurate you can have a speaker that looks like a big honking metal mic perched on top of your iPhone. Choose from gold or silver tone to match your personal degree of bling. No batteries are required; instead the design boasts a built-in rechargeable Lithium Ion battery that draws its juice from your laptop or desktop computer via a USB connector. Fully charged, the speaker will play for up to six hours. 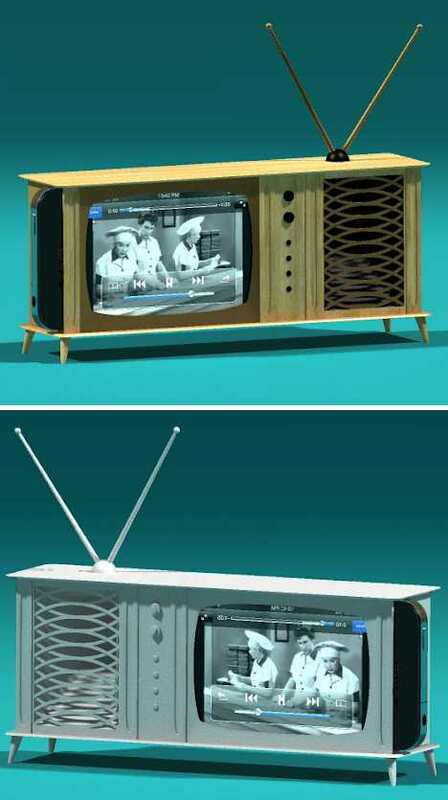 Those hulking home console stereo systems from the fabulous Fifties were the polar opposite of today’s light, portable and much more powerful mobile phones and music players. That’s why this miniaturized version of the old wooden wonder from Schreer Delights is such a kick as an iPhone amplifier. It was either that, or design an iPhone as big as a coffee table. Mobile phones have come a long way since their brick-like ancestors wowed consumers back in the 1970s… imagine what those consumers would think of the latest model iPhone? 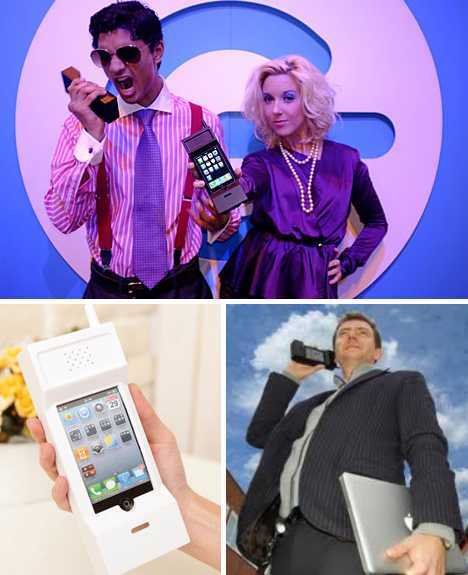 They’d be even more amazed by today’s consumers modifying their sleek iPhones with clunky, boxy, brick-like cases. Why go back when the future’s where it’s at? Maybe those old-style cellphones had some advantages that have been lost along the way, such as being too big to lose? Or perhaps their owners are actually time travelers… hey, if you had to live through the Disco Era you’d want to escape too! Are retrofuturistic iPhone accessories like these really veiled critiques of Apple’s much-praised but rather Plain Jane corporate style? Do stereotypically smug iPhone owners secretly crave a side-order of non-Jobsian personality with their mass-produced main course? Make of it what you will, but it just might be that Apple’s ubiquitous presence in today’s society has sparked nostalgia for times when the Apple in your pocket was destined for your teacher’s desk.